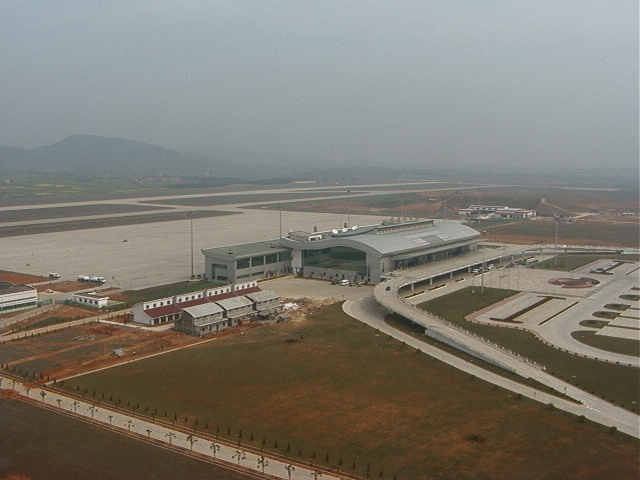 Nanchang Changbei International Airport is an airport in Nanchang, Jiangxi, People’s Republic of China. (IATA: KHN, ICAO: ZSCN). It is located 28 km north of Nanchang. Construction began in October 1996 and went into operation on September 10, 1999. Nanchang Changbei International Airport replaced Nanchang Xiangtang airport which was a joint civilian and military airport. It currently has one runway with a length of 2800 metres and a terminal building with six gates. Nanchang Changbei serves mainly mainland Chinese airports (see list below) and Hong Kong. 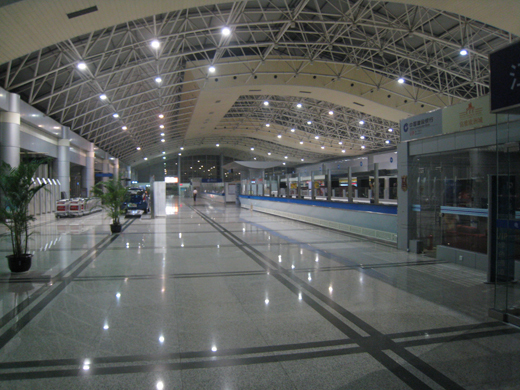 However in February 2004, Nanchang airport was promoted to international airport status when it commenced international flights. Scheduled and charter destinations now include Incheon International Airport, Korea. Nanchang Public Transport Corporation operates two airport routes from the city. These are high profile buses with underbelly luggage compartments. Airport Public Bus Route 1 serves between Nanchang Railway Station and the airport, with stops along Bayi Avenue, Yangming Avenue and Lushan Avenue north of Gan River. These stops include Lao-fu-shan, Nanchang Bus Station (or Ganjiang hotel across the street), Jiangxi Hotel, Hongdu Hotel, Yingshang. Airport Public Bus Route 2 serves between the Aviation Hotel (on Hongcheng Lu, near the Hongcheng Market) and the airport. It makes one stop at the Fenghe Interchange in south Honggutan. It has been observed that some of these buses do not change their head signs when they operate on a different route. For example, a bus running between the railway station and the airport may display Airport Route 2.